Review: Hello Fresh Delivers! 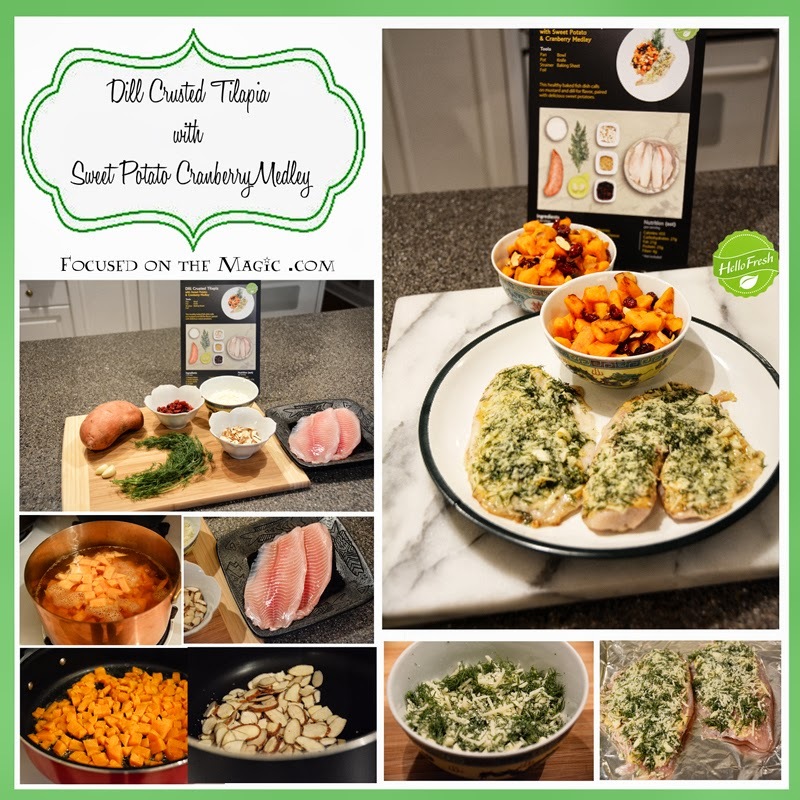 | Focused on the Magic : Review: Hello Fresh Delivers! Recently I was fortunate enough to receive this product and service for free in exchange for my review with the Hello Fresh Blogger Review Program. I was very excited, as I am a foodie who cooks at least 2 meals a day for my family and spends a lot of time reviewing and revising recipes. Hello Fresh is a subscription meal delivery service that delivers right to your door. Yes, your door! I'm anxious to try it at my Disney Vacation Club resort! Each weekly delivery includes all the fresh ingredients and detailed recipes that allow you to make a scrumptious meal in just 30 minutes. Leaving you with plenty of time to focus on the magic of cooking. Here's how my Classic Box arrived - in a thickly insulated box with long-lasting ice packs. All the ingredients for three delicious meals - each packaged separately and clearly labeled. The meals designed by the Hello Fresh chef's were all interesting and easy to make. If you can read a recipe, you can create their dishes! Here's a look at the first meal I made, Dill Crusted Tilapia with Sweet Potato & Cranberry Medley. I wish these pictures were scratch and sniff. It smelled so good and tasted even better! The preparation process was made very easy with the recipe cards. This was a huge success and we raved about this dish for days. 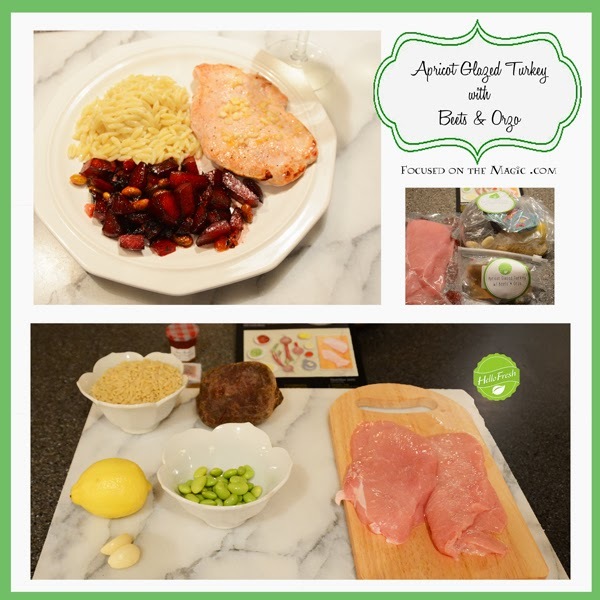 Dinner #2 was Apricot Glazed Turkey with Beets & Orzo. Again the portions were generous, easy to make and the taste was fantastic. It was a unique experience as I never would have thought to combine these ingredients. All went well except that I made the mistake of adding the Edamame in before the beets were done which caused the Edamame to over cook a little. Still a winner and really delicious. I have made it since using frozen Edamame for convenience and the taste was still wonderful!! Dinner #3 was Lamb Cassoulet with Mushrooms and another huge hit. So much so that when my husband returned from his trip I made it for all of us with great success. This will become a regular for our family. Of the two Hello Fresh box options, Vegetarian and Classic, I chose the Classic Box with substitutions. Do to my bungling and almost canceling the original order I received my box without the substitutions. Hello Fresh customer service was amazing! They returned emails right away and helped me straighten everything out so that the order arrived on time despite my bungling. The meals I ordered were designed for 2 adults so I waited for my husband to be out of town on a business trip to prepare them with my son. My husband is not a big fan of fish and is not as much of an adventurous diner as we are. The portions were huge in all the meals we had. There was enough food for 3 hungry adults. I now know my husband would have enjoyed everything but the fish dish. The ingredients were all very fresh, packaged perfectly and arrived cold in the insulated box which was left on my front porch right on time. The insulation is very thick and would have held the ingredients cold in the box for many hours. The prices vary depending on how many people you are ordering meals for (you can order meals for 2 or 4), and if you choose the Classic Box or Vegetarian Box. This is service is a convenience that I will use again and highly recommend to anyone.